Enriched Geranium: Appliances-SFB "SFB" now available! 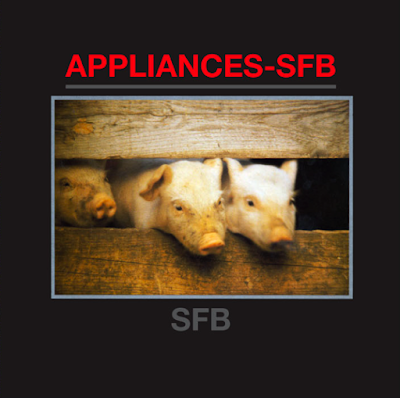 SFB, the first album by Appliances-SFB, is available on CD at last! Although I have yet to see it, I'm told that B-Side in Madison has it in stock. Mad City Music Exchange would be another possibility, as would Atomic Records in Milwaukee. Re-issued by Rockhaus in Milwaukee, it can be obtained directly from them as well. It's a little tricky to find on their website, but if you call or email them, I'm sure they'd be happy to sell you a copy. While you're at it, pick up a copy of 3rd & Long. You'll be glad you did. 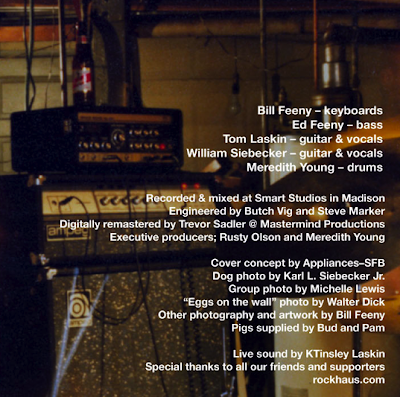 Also, keep your eyes peeled for the upcoming re-issue of Them/Green Door, the second album by Appliances-SFB, coming soon from Rockhaus. Cool! Hey all you rockin' and rollin' readers of Ed's blog -- buy this album! You won't be disappointed. I've been off of the Internet for a few weeks, so I'm just catching up on distant bloggy friends -- and on those who live across town. That is so exciting about the CD! I'll request that the Verona library buy a copy. Once I get a paycheck, I'll go out and buy a copy. I like the fact that the pig suppliers got mentioned. Here's the thing. I know that I saw you guys in the eighties. I just don't really remember where or when. Which about sums up the last part of that decade for me. I do remember what the SFB stood for. Thanks for the plug, Suzy! Now if I can only get my hands on a copy. You might think a band member would be able to get at least one copy before it hits the stores. Crayons: Just remember, this isn't folk music, but in my completely unbiased opinion, I think it's good music regardless of one's personal tastes. Jess: We used to play at O' Cayz Corral and The Club De Wash (before they both burned down) quite frequently, so those seem like obvious possibilities. There are others, though. SFB = Short, Fat & Balding? Sharks Fear Bears? Golly, I just don't remember. Jess, there would also have been Merlin's or or that place on University Ave. across from the old hospital ... what was it called? They played there frequently for a while. The place on University Avenue was G.S. Vig's. And, of course, there was The Havana Club, Turner Hall, The Wagon Wheel and Headliners. Maybe more. I can't remember anymore. God, I miss Turner Hall. Leveled for what -- a stupid parking lot??? Holy cow! It was about time. Had to purchase the SFB album twice because i have worn out my copy over the years. But for what it's worth, i now have a signed copy off ebay, lol. Gawd bless this band...!! I'm glad to know there are people out there who remember A-SFB. Dear Ed, i not just remember SFB, i love 'em. Although i am not complete (the first 7" is missing here) i can say that i have all your albums and i think esp. the SFB album is a classic and i will order the cd sooner or later. DD: Glad to hear it. If you want a copy of the first 7", I might be able to get one for you. Do you mean the 1980 7" EP Neofascist/Living In America/Danger Zone/Unease (different lineup from all the other recordings; Bill Ylitalo on bass and Richard Nayer on drums) or the 1983 7" single Waiting For The Europeans/Head Culture? Or both? Anyway, I think there might be a few copies floating around, but I don't know who has them. Let me know if you want me to try and track them down. There's also a possibility that Rockhaus will release those on CD after he releases Them/Green Door. Ed, sorry for the delay --- i never heard of that one and i'd love to get my greedy hands on it! Are there any ASFB live tapes out there? I always wonder what you guys sounded live like -- must have been pretty wild from what i have read back then. O well, now i have bookmarked your blog so i want miss it. Anyway, happy 2010!